We came up with a new site where user dont have to follow the news,news will follow the user as per the customized way. Its very easy to access. Just sign in first and u r ready to use the service. Now you can enjoy customized news at your own way. Gumtowers is a site where news will follow you wherever you go. So Be updated with a news and let other follow you back. 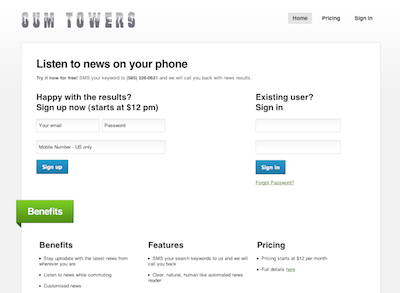 Gumtowers provide the customized news in the real time.